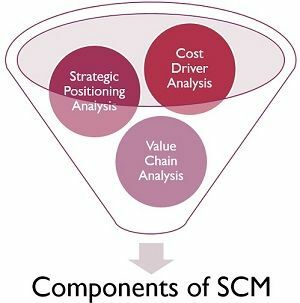 Definition: Strategic Cost Management or otherwise called as SCM is the cost management technique that aims at reducing costs while strengthening the position of the business. It is a process of combining the decision-making structure with the cost information, in order to reinforce the business strategy as a whole. It measures and manages costs to align the same with the company’s business strategy. Communication of Strategies in the entire organization. Planning and Carrying out tactics, to execute those strategies. Developing and implementing controls to track the success. In Strategic Cost Management (SCM), primary importance is given to constant improvement in the product to provide better quality to its target customers. It is an essential part of the value chain that covers every facet such as purchase, design, production, sales and service. It is an updated form of cost analysis, in which the strategic elements are more clear and formal and improves the overall position of the company. It is used to analyse cost information, and use it to develop various measures to achieve a sustainable competitive advantage. It provides a better understanding of the overall cost structure in the quest of gaining a sustainable competitive advantage. It uses cost information specifically to govern the strategic management process – formulation, communication, implementation and control. It helps in identifying the cost relationship between value chain activities and its process of management to gain competitive advantage. The strategic cost management must be implemented at the initial stages of production, so as to reduce heavy cost failure. Strategic Positioning Analysis: It determines the company’s comparative position in the industry in terms of performance. Cost Driver Analysis: Cost is driven by different interrelated factors. In strategic cost management, the cost driver is divided into two categories, i.e. structural cost drivers and executional cost drivers. It examines, measures and explains the financial effect of the cost driver concerned with the activity. Value Chain Analysis: The process in which a firm recognizes and analyses, all the activities and functions that contribute to the final product. It was propounded by Michael Porter (1985), to show the way a customer value assembles along the activity chain that results in the final product or service. In a nutshell, strategic cost management is not just about controlling the costs but also uses the information for managerial decision making. The fundamental objective of strategic cost management (SCM) is to gain a sustainable competitive advantage by way of product differentiation and cost leadership.